I love your blog and have been following it for about 18 months. I know you've reviewed the Brown Betty Bakery before in Philadelphia, but I haven't seen anything on the blog about Brown Betty Petite, their new downtown cupcake shop. My friends and I recently visited, and I wanted to share some pictures and our reviews with you. 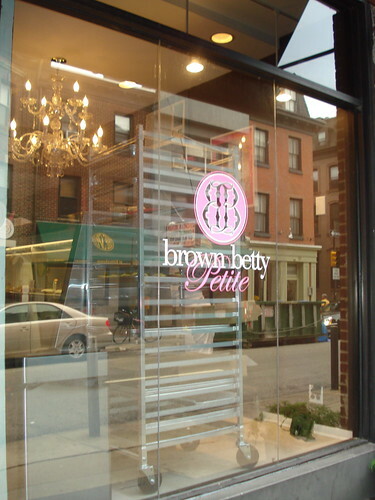 Brown Betty Petite is located at 20th and Manning near Rittenhouse Square. The shop lives up to the "petite" part of its name--it is quite small. That doesn't stop it from being absolutely charming, though, with a pink-striped awning, dark chocolate walls accented with hot pink, and ornate chandelier inside. 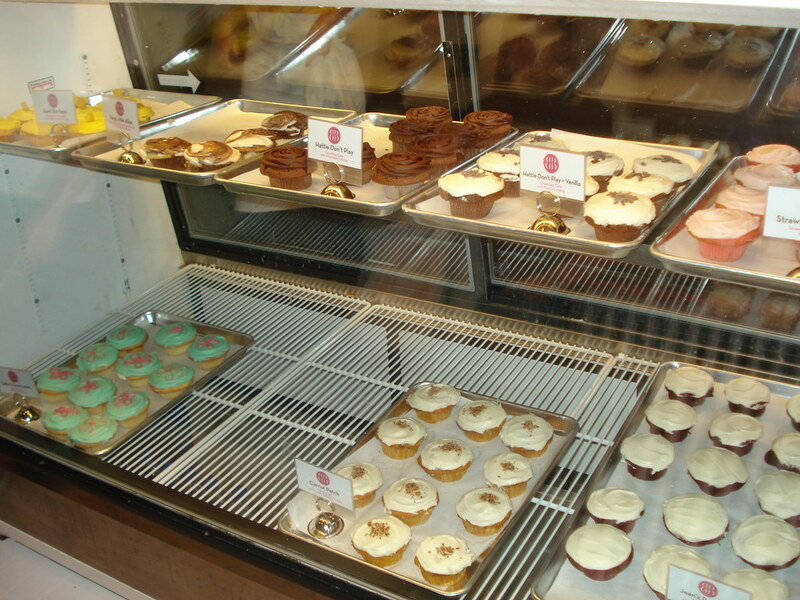 The shop has just one case for its cupcakes, and most flavors rotate on a daily basis. We went on a Saturday afternoon, and the shop was quite busy; they were even out of menus, change, and a few types of cupcakes. After much deliberation, I decided to try Carrot Patch (carrot cake with cream cheese frosting). I also purchased Sallie's Sourcream (vanilla poundcake with vanilla frosting), Hattie Don't Play + Vanilla (chocolate cake with vanilla frosting), and Sing Little Alice (chocolate and vanilla cake swirled with matching frosting) to take home. We headed back to Rittenhouse Square to snack on our treats. The carrot cake was loaded with carrots, raisins, and finely chopped walnuts and was very moist. The cream cheese icing was a little sweet, but I love icing and thought there was just enough to balance out the cake. My friends tried the Sallie's Sourcream and Jean's Road Trip (red velvet cake with cream cheese frosting). The vanilla poundcake was a bit dense. She also thought that the icing was excellent, though. The red velvet cake was good, but she was surprised how strongly the chocolate taste came through. She loved the icing as well and thought it helped balance the cake. One of my roommates tried the Hattie Don't Play + Vanilla that I brought home, and he agreed with us that the icing was amazing. He thought the chocolate cake was a little dry. It was definitely crumbly, but that didn't stop him from enjoying every bit of it. All in all, we enjoyed Brown Betty Petite and will definitely be back! 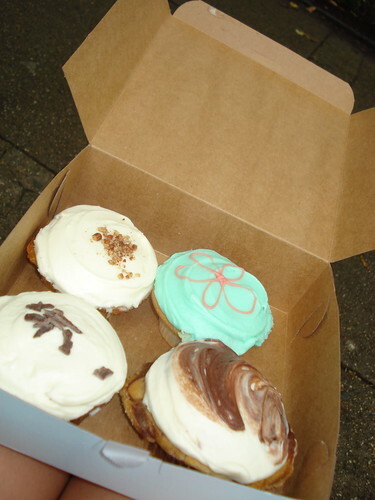 They are the only cupcake shop in Philadelphia and set a high bar for others.